Focus on the details With four little letters on some string, we instantly know which season we’re celebrating! Small details like this can be achieved very easily with a sheet of paper and a pair of scissors. This DIY bunting hangs from an easy-to-make wooden tree, but could equally well be stuck on a wall, strung across the corner of a mirror or hung along a banister.TELL US…Do you have a favourite way to decorate your home at Christmas? Share your tips and photos in the Comments below. 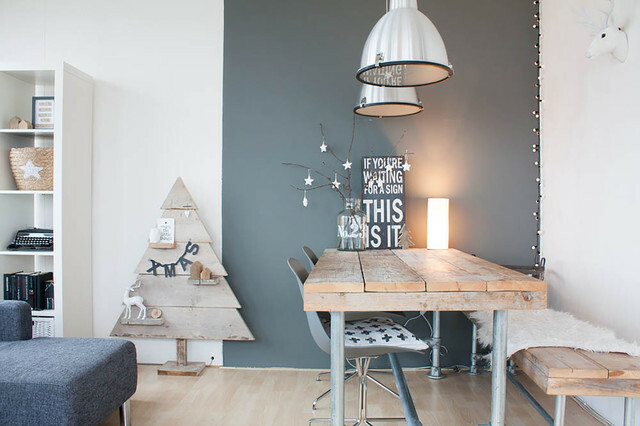 Driftwood Christmas tree with shelves ?add hooks for decorations?